Have you ever found a stray that was a little underweight? Maybe your cat became sick and lost several pounds? Whatever your situation, sometimes our feline friends need some extra calories in order to obtain the proper nourishment they need. 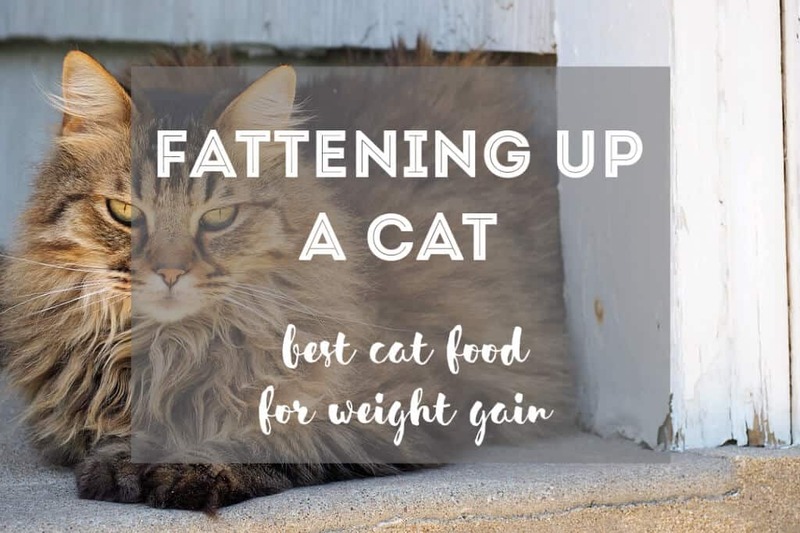 Learn how to make your cat gain weight, and see our selection of high-calorie cat food for the best cat food to gain weight. Why Is Your Cat Losing Weight? A high-calorie diet is packed with lots of protein and fat content. 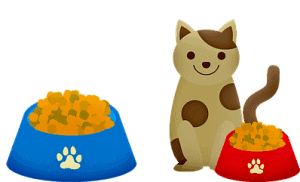 The cat food options below are premium cat food brands that will help your cat reach its ideal weight and stay there. 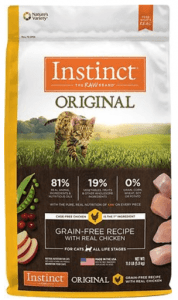 They are packed with protein, are nutrient-dense, and meet the nutritional levels required for a healthy, happy feline. Kitten food offers a well-balanced diet for pregnant cats, and it’s recommended to get special senior cat food for older cats — but in either case, it’s always important to check with your vet first. Also, kitten foods tend to be higher in fat content, which might be an option for quickly fattening up your cat. Even though the 2 other options offer a slightly higher protein content, Blue Buffalo is our personal favorite. It’s a brand we have been trusting for years with our Yoda and it worked wonders when we needed it most (see our experience below). This brand was created by the Bishop family, inspired by their pet “Blue” who struggled with cancer. Their research for the healthiest solutions led them to create a super high-quality pet food that would only use the finest ingredients. 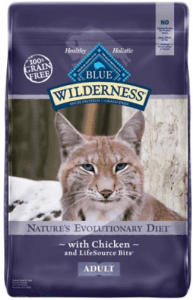 This is exactly what Blue Buffalo provides: Quality ingredients (made in the US) that will nourish your beast and provide your cat with healthy, wholesome nourishment. Balanced calories from proteins and fats: 443 calories/cup, 40% protein and 18% crude fat! Each of the cat food choices in the table above offers wholesome, rich-in-protein, nutritional ingredients. While these options are great for everyday use to keep your cat healthy, gain weight and maintain weight, these are not specially designed for super quick weight gain (for severely injured or ill cats, for example). Remember, the best food to make a skinny cat gain weight is 1.) a healthy food (like the ones above), 2.) optimal feeding frequency + fresh water, 3.) extra cat treats or calorie-dense nutritional cat gel. Prescription formulas for weak or sick cats (aka high-calorie cat food for sick cats) should be recommended by a vet, however, many vets and pet owners recommend providing a supplemental calorie-dense gel, such as Tomlyn’s (see below) to help add calories to your cat’s meal fast. Tomlyn’s high-calorie nutritional gel for cats contains 30.0% crude fat and has 28 kcal per teaspoon. 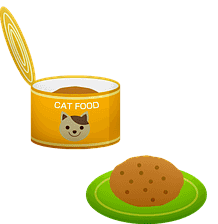 Simply add a little bit to your cat’s dish at meal time for quick weight gain or use to attract an otherwise finicky cat to eat. 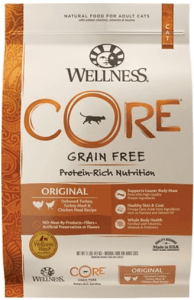 In cases where you have already spoken with a vet and you know your cat’s target weight, the above food brands are a great source of healthy nutrition for cats. We’ve compared TEN popular wet cat food brands to find the highest caloric content in each, combined with the highest percentage of crude protein and crude fat. 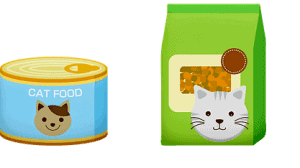 Here are the top 3 most fattening wet cat foods from our comparison. We promise you, this post is not sponsored by Blue Buffalo, we simply believe that they have the best-canned cat food for weight gain (and in general) out there. Their wet cat food is made with the same delicious & nutritious ingredients than the dry version but with the added moisture that guarantees increased hydration that will contribute to your cat’s digestive and urinary health. It’s also a great way to make kitty’s meal a little bit more enticing! Without saying that you need to feed your cat with caviar, it’s important to try and provide him or her with some variety in their diet. Boredom could lead to lower food intake, resulting in disappointing results in terms of weight gain. Don’t hesitate to try different flavors to understand what your cat loves. Remember, it’s sometimes better to choose a food with a slightly lower calorie content if it’s the only way your cat will eat! Improvements for the canned version: The variety pack only comes in the very small cans which are more expensive. However, buying in bulk for a specific flavor will save you money. We often buy a single flavor pack of 24 until it runs out and then switch flavors. If you want to prepare the best homemade high-calorie cat food (as a supplement to the options mentioned above), our recipe will give you the keys to make a simple wholesome meal that will help your kitty get back to their normal weight. Mix the chicken + bones in a grinder. Then, mix it with the rest of the ingredients in a food processor until you get the right consistency (similar to wet food texture). You can now serve this feast to your beast! (Read more about homemade cat food here). Use this simple homemade recipe as an appetizing snack to fatten up your cat (but please provide a regular balanced diet for your cat as well). First, before adjusting your cat’s diet or feeding schedule, it’s important to check with the veterinarian to find out why your cat is losing weight or why your cat won’t gain weight. If your cat at home is losing weight and you don’t know why then check with the vet first. Your cat may have an underlying health condition or the food you provide may not be nutritious enough. There are several ways you can help your kitty reach a healthy weight. Remember, always consult a vet before making drastic changes to your cat’s diet. Moreover, if you’re ever unsure or have doubts, don’t hesitate to talk to your vet! In many cases, your cat might not be gaining weight because of worms or parasites. Sometimes you might go months without realizing your cat has worms. If your cat looks scraggy, isn’t gaining weight, or has poor fur quality, check your cat for worms. A quick deworming tablet will help rid of any worms so your cat can once again gain weight. Choosing a high-quality cat food is the first step. Make sure that the first couple ingredients include real, wholesome meat (protein). Avoid cat foods high in corn, soy, cereals, additives, meat by-products, etc., as these are difficult to digest and not nutritionally-beneficial for cats (especially over the long-term). Select cat foods that are high in protein with a quality amount of fats. Avoid carbs and aim for only premium cat food brands. Help your cat gain weight by increasing feeding frequency and amounts. Cats would much prefer to eat smaller portions of food several times a day rather than one large bowl once per day. Eating smaller proprotions more frequently is actually more natural for cats’ digestive systems and will encourage kitty to have an appetite and eat more. Try increasing the amount of food and spreading it out across the day. So instead of one lump of kibble once a day, split it into 3 (for example). Dry cat food is often higher in calories than wet cat food (because of moisture content, etc). However, if you choose to provide a dry-food diet to your cat, just make sure to provide plenty of fresh, clean water to ensure your cat is getting hydrated properly! If you wish to encourage a finicky cat to eat more and gain weight, try mixing the dry cat food with wet cat food. In most cases, cats are drawn towards wet cat food more than plain dry kibble. This trick is what helped our Yoda gain weight (more on that below). H3 essentials offer a great line of healthy, freeze-dried cat treats that treat kitty to nutritious raw meat. A part of the proceeds helps support the Big Cat Rescue sanctuary in Florida. Read about Yoda and his awesome treats to help spread the word about the “Little cats helping big cats” campaign. In addition to a healthy dry and wet cat food diet, consider adding wholesome cooked ingredients to their meal–such as unseasoned chicken breast or plain rice. You can indeed use human food to fatten up a cat. Check out our handy article on human foods cats can eat (and foods that should be avoided). See our updated “Can Cats Eat That? ?” article on the top FAQ about which popular foods cats can eat. In addition to increasing your cat’s food proportions or supplementing their diet with fattening treats, always make sure to provide a fresh bowl of water every day. Hydration (or lack thereof) is a leading factor in the overall health of your cat and their weight. If you find yourself out of time (or find yourself forgetting) to clean out your cat’s water bowl and refreshen it with new water, then consider getting a cat water fountain. Just like with us humans, cats work up an appetite after they exercise. Keeping your cat active could actually help your cat gain weight by stimulating the senses and “revving up the engine,” so to speak. In observing Yoda, he has much more of an appetite after being active all morning (or afternoon) rather than after he wakes up from a long nap. Our Experience: When Yoda Missed His Pawents! After spending a few months in sunny Mexico, we had to fly for the summer to visit family and friends back in France and the USA. A good friend of ours was taking care of our beast until the day we were coming back. When we came back after roughly five weeks, our beast had lost 1.1 kg. It was clearly visible and we started worrying that he might have caught something while we were gone. After a visit at the vet and a long week of feeding him a combo of dry and wet cat food, plus treats, our Yoda was already on his way back to his normal chubbiness, eating plenty and getting his little belly back. It appears our furry friend dearly missed us and our absence translated into a big loss of appetite. Nothing more, nothing less! This was a big lesson for us and highlighted once more that animals have a deep affection for us (even if they don’t always show it). If they perceive time in their own way, they certainly perceive the absence of their human friends! Weight gain in cats is tricky and just as important as weight loss in cats, as both of these areas can become a life-threatening issue. Always take note when your cat is losing weight as this is a sign of a physical, mental, or health problem. Sometimes simply changing their diet serves as a quick fix, however, don’t take any risks! Weight loss can happen very fast, so it’s important to keep your cat’s health in check. Never hesitate to contact a vet if you have any doubts about your cat’s health. These fattening cat foods above are tried and tested. Not only will these cat foods help your cat gain its weight back, but they’ll help your cat maintain a healthy weight. For more information on cat nutrition, visit our ultimate guide here. Great article. I feed several feral cats, recently one had lost a ton of weight and was looking bad. I trapped him and got him to the vet. He had an infected bite wound that was treated but was healthy otherwise. I nursed him back and he’s been looking good until the last few days. He’s losing his appetite and looking skinny again. After reading this article.i ran out and got him dry and wet Blue Wilderness. He seemed to really like it, and ate a lot of it. Fingers crossed. I’ve got to fatten up my boy. Thanks for the information. Thank you for all the info! I have two young cats that are so skinny so I was looking for ways to fatten them up a bit. I think I will switch to one of the recommended foods from the list and get them some treats!!! Hey there! Thanks so much for your sweet comment! We are pawsitive you’ll find food that fits your kitties just right! 🙂 Thank you for your comment and good luck!